On December 12, 2012, after five and a half years living in Paris, we moved back to the United States, and have settled in San Diego, California. When we started this blog back in 2007, we imagined that we’d document every step of our journey to get to France and all the interesting experiences we were to have as expatriates living there. In practice, we found that we were always too busy living life to document it, and despite our best intentions, we ran out of steam for new blog posts by 2008. I thought I should add just one last entry to wrap up the blog in case anyone wonders what happened. During our time in France, we had many adventures. We also had a child, who’s now two and a half! Life in Paris was everything we expected it to be—wonderful, terrible, enriching, confusing, relaxing, stressful. We had some of the best times of our lives there, and some awful experiences too. We met some wonderful people and made lasting friendships. We are incredibly glad we did it—it was life-changing, that’s for sure. But we are also happy to be back in North America. Why did we leave? It wasn’t because we got sick of France. We still love Paris, and in fact we already know we’ll be back for a visit in less than a year. The reasons for our decision are many and complex, but they boil down to this: We realized that we’d had the experience we wanted to have. We accomplished our mission, and as such, staying there no longer fit with our top priorities in life. The things that feel most important now are better accomplished in North America, and more particularly here in Southern California. We think it’s the right move for our family, our careers, and our well-being. Perhaps one day in the future we’ll decide to live in France again. Or perhaps we’ll go somewhere we haven’t imagined yet. But for now, we’ll enjoy the sunshine, excellent Mexican food, and less-frantic pace of life here in San Diego. If you’ve come to this blog because you’re interested in moving to France, we still think that’s an outstanding idea, and we wish you the very best in your efforts! As a service to proprietors of eating and drinking establishments (whether in Paris or beyond) I offer the following common, but still pertinent, observation: sometimes it’s the little things that impress us (your customers) most. Case in point: this afternoon Joe and I spent a few hours at a café across from the parc des Buttes Chaumont in the 19th arrondissement, and despite certain irritations (smokers taking over an enclosed terrace, less-than-fresh baked goods), there was one thing that redeemed the experience for us. Joe discovered it first. “This place has the second-best hand dryer in the city. I’d come here just to dry my hands!” After checking out the facilities for myself, I had to agree that the hand dryer in the restroom was quite wonderful. For one thing, it was extremely sensitive to motion, so much so that just washing my hands near it caused it to turn on (I don’t know how many times I’ve frantically waved my dripping wet hands beneath a dryer trying to engage the motion sensor, looking like an idiot in the process). Secondly, this hand dryer was extremely powerful, drying my hands in record time. We don’t take these things for granted here, as it seems hand dryers are the default in most public restrooms in Paris, yet so few of them work as well as they should. While I’m willing to believe that hand dryers are easier on the environment than paper towels (not sure if this has been proven, but it seems likely), from what I’ve seen of my fellow restroom-goers, the lack of a good drying option seems to discourage hand-washing and/or encourage wiping hands on clothes (neither of which are exactly hygienic). As for the best hand dryer in the city, that honor belongs to Point WC, a slightly wacky facility located in a shopping mall along the Champs Elysées. The minds behind Point WC aim to provide their customers with an elegant restroom experience, complete with artfully designed and decorated cubicles (the trappings of which are available for sale in the adjacent gift shop). I wasn’t so impressed by the chance to own a piece of the place (candles, designer toilet paper! ), nor by their claim of it being the cleanest restroom in the city (for a fee of 1.5 euros, it better be), but their hand dryer (literally) blew me away. Although I wasn’t aware of its existence previously, the gizmo in question certainly lived up to its pedigree. Known as the Dyson Airblade, this device from the makers of the Dyson vacuum was extremely impressive. I stuck my wet hands into it (think of a piece of bread in a toaster) and as I drew them out again, my hands were completely dry. Now that the smoking ban has taken effect, I think this new kind of hot air should become a trend in Parisian cafés. I’m not holding my breath. Today is the one-year anniversary of our move to Paris! We celebrated that tiring, stressful move across the ocean by undertaking a tiring, stressful move across the city to a new apartment. We’ve got some recuperating ahead of us, but other than that, we’re still very happy to be here, and looking forward to the next phase of our stay. All in all, it’s been a great year. Our apartment: When we first moved to Paris, we signed a one-year lease on an apartment, figuring that we’d take some time to get to know the city and decide where we’d like to live longer-term. Because of the unfavorable (to us) changes in the dollar-to-euro exchange rate, our rent effectively increased by about $300 per month over the last year, which was rough on our budget. So we found an apartment that’s much less expensive—also much smaller, and without a view, but such is life. Some friends of ours are living there now, and they’re moving to Canada, so we’re going to move in as soon as they move out, which makes things more convenient for all of us (and their landlord). Unfortunately, the new place isn’t available until around August 1 and our old apartment was being sold, so we had to find a temporary place just for the month of July. Two moves in one month! Yay! But our new home will be more conveniently located, and quieter; that should help to make up for the four flights of stairs we’ll get to climb. 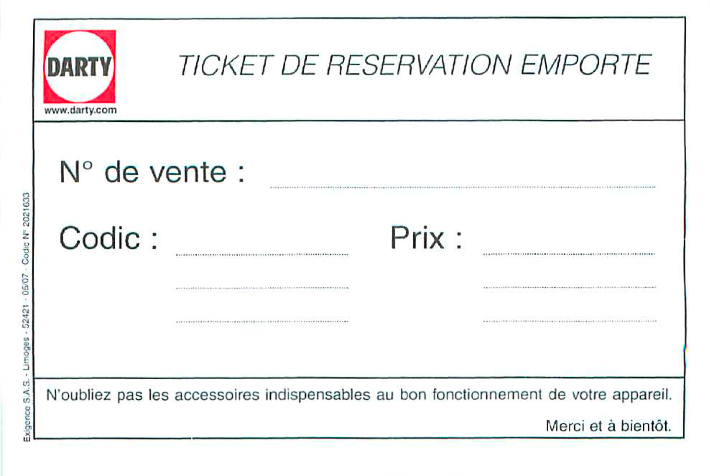 Our cartes de séjour: It’s already time for us to renew our long-term residence cards, and I can’t tell you how enthused we are about the process. (Insert your favorite expression for “much less than not at all.”) Last year, applying for the cards was a source of great anxiety, and although renewing them should be simpler (you can even do it by courier now, rather than making an appointment to present your dossier in person at the préfecture), we’re working our way through some complications that have made the process less straightforward than we hoped. Wish us luck! Our French: The number-one question people ask us is how well we speak French, especially now that we’ve (presumably) had plenty of opportunities to practice it. The honest answer is “not a whole lot better than we did a year ago.” Well, OK, some better, but not well. We’d planned on taking classes as soon as we moved here, but for lack of both time and money, that didn’t happen. And since we both work at home, we aren’t forced to interact with French-speaking people all day, every day. But we are now optimistic that we’ll have sufficient monetary and temporal resources to apply ourselves in earnest to language learning beginning in September. We’ve had several recommendations for the Alliance Française, so we’ll be looking into that as well as reviewing the other 12,473 French schools, tutors, discussion groups, and other language learning options the city has to offer. The state of our blogs: Believe me, no one could be less happy than I am about the near-total lack of new content on not only this blog but all our other sites (especially Interesting Thing of the Day) this year. I agonize over it constantly, not that I’ve had much actual time for agonizing. For pretty much the entire year so far, I’ve had one major writing deadline right after another, and since the books and articles I write about Mac stuff are what keep a roof over our heads, I haven’t had the luxury to turn down any assignments that would free up enough time to work on my own sites. (And Morgen has had her own series of time constraints.) However, that same light at the end of the tunnel that makes me believe we can pull off French classes in a couple of months gives me hope that we’ll soon be able to pay significant attention to our blogs. So that’s the quick update. Thanks for all the notes and comments—we really appreciate knowing that people are thinking about us! We’d been in need of a new bathroom scale, so yesterday we headed to a local Darty, a chain of stores with a selection somewhat like Best Buy—appliances, electronics, and suchlike. I was expecting this to be an extremely simple operation: pick out a scale, take it to the register, pay for it, and leave. But ah—this is France. We eventually settled on a unattractive but cheap model with a digital display and a nonslip surface. So now all we had to do was pay for it and leave. But wait—how does one actually do that? Having spent a considerable portion of my career designing software, I’ve formed an opinion or two about good user interface, and Darty struck me as an example of very bad user interface, because there was nothing to inform us, the customers, of how one goes about purchasing merchandise. As is usual in stores of this sort, the shelves at Darty have just one exemplar of each item on display; you decide what you want and then somehow retrieve the actual box you’ll take home from a storeroom in the back. That’s fine. Now here’s the thing: exactly how do you go about getting the item from the back? There were no signs, anywhere in the store, explaining what the process is. We thought maybe there were forms to fill out and hand in, but we looked all around and couldn’t find any. Each item did have a label with a SKU (a unique numeric identifier), so we thought about just writing down the one for our scale, but then we couldn’t determine where to take that number—to the counter at the back, where people were clearly picking things up, or to the front, where people were clearly paying for them, or to any of the numerous sales desks around the store, or what? After spending considerable time observing other customers, we worked out that there were indeed special slips of paper onto which the SKU had to be written, but these were only to be found in the pockets of salespeople. All the salespeople were busy either helping other customers or participating in a game I’ll call “darty,” which involved suddenly darting away whenever we cast a hopeful glance in their direction. Then she walked over to a computer station, typed in the number, and confirmed that the scale was in stock. The computer gave her another number, which she also wrote on the slip, instructing us to go up to the front and hand it to the cashier. OK. So we paid, and received a form in triplicate that we then had to take to the pick-up desk. The helpful clerk there had already retrieved the scale from the storeroom, so she just scanned our paper and stuck the scale in a bag (with two of the three pages the cashier had given us), and out we went. Leave it to the experts: French people are used to asking for assistance constantly, including nearly every time they buy something. If you go to the market for a melon, the grocer has to pick out the right one for you. If you want some nonprescription pain reliever, you still have to ask a pharmacist. And if you want a scale, you will of course naturally ask a salesperson. The whole notion of consumers simply reading labels and making decisions on their own is rather foreign. No job is too small: France has a high unemployment rate but very high job security for those who do have jobs, and businesses tend to be designed to employ the maximum number of people. (Contrast this with the North American model of trying to reduce overhead by increasing efficiency and reducing the number of employees.) So of course one person could have taken our order, picked up the scale, and taken our money—but then there would be no reason to employ the other two. Paper, paper everywhere: Counting the reservation ticket, the triplicate order form, the credit card receipt handed to me, and the duplicate receipt the cashier put into his file, the sale of this scale generated six pieces of paper. That’s very much the norm here. Seemingly nothing can be done without reams of documentation being created. Coming from the U.S. where you now often have to pay extra for paper copies of things like utility bills and bank statements, this focus on paper seems rather old-fashioned. Anyway, we did successfully leave with the scale of our choice, for a very reasonable 20 euros. And this was an interesting surprise: the switch on the bottom lets you choose not only pounds or kilograms, but also stones. Cool. The French expression for “no kidding” is sans blague (literally, “without joke”). Since blague sounds pretty much like “blog,” it makes for a nice little bilingual pun—bloggers = blagueurs (jokers); hence the name of our friend Meg’s blog, Le Blagueur à Paris. Anyway, we’ve been sans blog here for a while, sans blague. When I start getting inquiries from readers concerned for our well-being, I know we’ve fallen pretty far behind. So here’s a quick update. There are no problems. We are healthy, happy, safe, and solvent. We had a lovely trip to Spain at the end of February, and last month Morgen celebrated her third-of-a-century (33 years and 4 months) birthday. Springtime has been mostly lovely here in Paris, although it’s been kind of blustery this weekend. Also, we’ve been awfully busy. I’ve had one writing deadline after another for months, and even as I type this I feel incredibly guilty that I’m not instead finishing either of two books that are past due to my editor. I’m feverishly trying to get caught up with a long list of writing and editing projects, because later this month my son Ben is coming from California for a two-week visit, and shortly after he leaves, my mom and my niece will be here for a week. And then, not long after they leave, Morgen and I will be moving to a new apartment in the next arrondissement over. If we’re lucky, we might sneak a bit of a vacation in there somewhere. Which will be nice, because already the fall is filling up with still more projects. We have had, and continue to have, every intention of getting this blog (and our others, too) back in action. But with so much energy being put into actual income-producing work, there hasn’t been much time or enthusiasm left for recreational blogging recently. With luck, a certain amount of sanity will have returned to our schedule by mid-summer. In the meantime, we’ll post as time permits, and at some point we’ll go back and fill in all the interesting bits of our story that we’ve skipped over. Thanks for thinking of us! Today was going to be an exciting day anyway, because in a few hours Morgen and I are leaving for a one-week trip to Spain. We’ll be in the town of Marbella, on the southern coast, just a short drive from Gibraltar—which we might also visit. Perhaps we’ll even get adventurous and take a ferry across to Morocco. We’re celebrating the 10-year anniversary of our first date (February 24, which is also the anniversary of Laura Palmer’s death—an oddly appropriate coincidence for a couple of Twin Peaks fans). So, that would have been reason enough to be happy, but we have something else to celebrate too. On Wednesday we finally received confirmation from the Caisse Primaire d’Assurance Maladie (the French social security agency, which manages the national healthcare plan) that we’re in: we’re officially covered by France’s CMU (couverture maladie universelle), and in fact our coverage was made retroactive to the day we applied, back in December. We have an actual French social security number and everything, which I think is just terribly cool. Now, I realize that most people don’t regard a new health insurance policy as the most exciting thing in the world. But this has been a long and often very frustrating process for us; not so many months ago we had a bunch of different people telling us that we’d never be eligible for social security here, since we don’t have jobs in France (at least, not the way the French government thinks of jobs). Although we’ve had private insurance all along, it wasn’t great—a bunch of things weren’t covered, and we would have been in bad shape if any major medical expenses had arisen. But with the kind help of a friend who made some inquiries on our behalf and pointed us to the right forms to submit at the right office, we finally got past that hurdle. And now we can convert our third-party policy to a “top-off” plan that pays for what you might think of as the deductible or co-pay for the regular French health insurance. So we’re in good shape, and all for a mere (cough) 8 percent of our annual income. Anyway: off to Spain! It’s our first European vacation since moving here last summer, and I can hardly wait. We’ll report back, with pictures, as soon as we can. I was awakened this morning (that would be, er, yesterday morning, as I’m writing after midnight) by the doorbell, but I only had 30 seconds to be grumpy about it. It was the mail carrier, delivering my French driver’s license (two signatures required for delivery). Back when I passed my road test, I asked my driving instructor how long it would take to get the actual license in the mail, and she said that two months was typical. But it came in only six weeks (to the day), which is nice. Especially considering that in another week, we’re heading to Spain for a weeklong vacation, and we’ll be in an area where it’s awkward to get around without a car (while one-week car rentals cost less than cab fare to and from the airport—go figure). It’s a sad day in Paris. A landmark dating to 1831, and one of our favorite places to immerse ourselves in decay and general weirdness, was severely damaged by fire yesterday morning. Deyrolle, the taxidermy shop and walk-in cabinet of curiosities, was the site of a major blaze yesterday morning that took 55 firefighters and 14 engines to extinguish. I wrote about Deyrolle several years ago on Interesting Thing of the Day. It had recently been renovated, and although Morgen had a chance to see it in its new (if brief) configuration, I did not. According to the store’s official blog (original French/Google English translation), their massive collections of mounted butterflies and other insects were destroyed, along with many of their stuffed animals (though I don’t know specifically which ones). The owners insist that Deyrolle will rise from the ashes (stuffed Phoenix, anyone? ), but it breaks my heart that visitors will never again be able to see the old shop as it once was. Today is—or rather yesterday (the 9th) was, since I’m writing this after midnight Paris time—my 41st birthday. This evening Morgen and I went out for dinner with some friends at a fantastic Indonesian restaurant near Les Halles, Djakarta Bali. I thought that was appropriate given that this time last year we were in Indonesia. (On my 40th birthday, we hiked to the rim of Mt. Bromo, an active volcano. Now that was a memorable day!) It brought back some great memories. The food was delicious, the background music was right on, and I got to impress our friends and the wait staff by using most of my meager Indonesian vocabulary (though it was weird to be switching among English, French, and Indonesian so frequently). Interestingly, tonight was our second consecutive evening of trilingual entertainment. Last night we attended the “avant-premiere” of the film The Oxford Murders, featuring a question-and-answer session with star Elijah Wood and director Álex de la Iglesia. Elijah speaks only English, while Álex is Spanish and speaks just a bit of English (and no French). So there was a French translator, but sometimes the director couldn’t figure out how to say something in English and slipped automatically into Spanish. After asking for linguistic help from the audience, a young woman came down to translate from Spanish into French, but the result was a hilarious mixture of three languages (often in the same sentence) and lots of staggered laughter as various segments of the audience got the gist of some joke. The movie itself, I’m sorry to say, was merely so-so, but it was great to see Elijah Wood in person, and the overall event was tremendous fun. But back to my birthday…what truly made today magical was returning home to find that one of the two elevators in our building was suddenly back in service! Both of the elevators have been en panne for about three and a half weeks, and that has been a major drag since we live on the 10th floor (meaning, because of the way floors are numbered here, that we have to walk up/down 11 flights of stairs). When we saw a handwritten sign saying the one elevator was working, we were in shock. Our neighbor from across the hall happened to be arriving home at the same time and was equally surprised. I mentioned that today was my birthday, and he agreed that it was a fantastic birthday gift. Well, I’ll say this much: La Poste is running efficiently this week. It took just 24 hours for the post office to deliver the results of yesterday’s practical driving exam. I passed! In fact, it appears from the notification as though I got a perfect score. Now I just wait to receive the actual license (permis de conduire) in the mail; in the meantime, my test report serves as a temporary license. Wow. I can’t tell you what a huge relief this is to me. 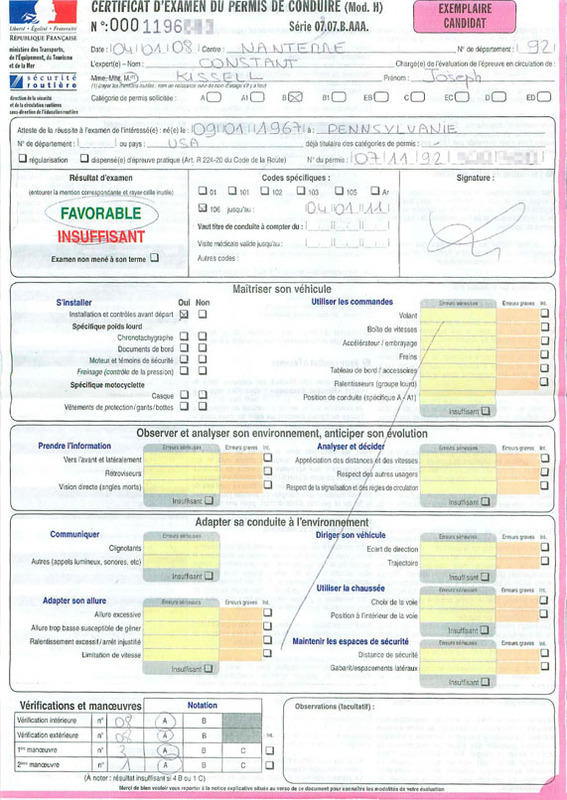 Having passed the notoriously difficult written portion of the test for my French driver’s license a few weeks ago and spent several further hours behind the wheel with an instructor from the driving school by my side, I was finally able to take my road test this morning. It was nerve-wracking, as I’d anticipated. I was mentally prepared for either of two outcomes: I pass and get my license, or I fail, take more lessons, and try the test again in a few weeks. Of course I hoped very much to pass, but given how unusual (from my perspective) the French traffic laws and expected driver behavior are, I accepted the possibility that I wouldn’t please the inspector on my first try. What I was completely unprepared for was what actually happened. I finished the course—having performed, I felt, generally quite well (though with a couple of minor flubs)—only to have the inspector tell me that she’d send me the results of my exam by mail. What…seriously? After all this anticipation and anxiety, I don’t even get a thumbs-up or thumbs-down at the end? Amazing but true. I have to wait for an envelope in my mailbox (supposedly as early as Monday) with the good or bad news. Geez. I think I passed. I was feeling good vibes from the inspector (95% of the time, anyway) and from my instructor—who sat in the backseat the whole time, ostensibly to translate, though in fact she barely said two words throughout the whole test. (Luckily, I have mastered the French expressions for “turn right,” “turn left,” “go straight,” and “park here,” which comprised the bulk of the instructions given during the exam.) But I don’t really know; the things I perceived as “oh-by-the-way-look-out-for-this” kinds of reminders may have been intended as “you-idiot-anyone-who-misses-this-obvious-thing-fails-instantly.” I guess I’ll find out in a few days. Update (January 5, 2008): I passed! Well, I’ve been living in interesting times. Less than a month ago, Morgen and I were wondering whether we were going to have a dull Christmas, since our budget was, shall we say, not conducive to travel (or bringing family members here to Paris). We were, however, looking forward to the week between Christmas and New Year’s as a time to start getting caught up with the many things we’d fallen behind on so that we could begin 2008 with relatively clean slates. On December 20, my mother called to tell me that my father had died that morning. He had been in the hospital for four months. Without getting into all the details, he’d had major surgery to treat a life-threatening condition in August and initially appeared to be on the road to recovery. In the months that followed he had periods of ups and downs, but then, for reasons that aren’t entirely clear to anyone, he abruptly began to deteriorate and died from what amounted to multiple systems failure less than three weeks before his 86th birthday. Morgen and I flew to Pennsylvania for the funeral, which was held on Christmas Eve, and spent a week with my mother before returning to Paris. I’ve had some unusual holidays, but this will surely be remembered as the most cheerless ever. I’ve been reflecting on our time in Paris—six months now, as of yesterday—and my predominant feeling is that of being mystified as to where all that time went. I don’t just mean that in the usual “time flies” sense. It feels as though I’ve been in a daze most of the time. We were, and are, delighted to be here; we enjoy the views, the vibe, the food, and everything else. But we (or at least I) have been remarkably distracted to the extent that it’s often been hard to appreciate or even be aware of where we are. During the second half of year, apart from the constant worries about my father’s health, I had a relentless succession of Really Big Deadlines (mainly Take Control books and Macworld articles); we had to work through the complex processes of getting our cartes de séjour (long-term French residence cards) and applying to join the French healthcare system; I took driving lessons so that I could get a French driver’s license (a notoriously long and difficult process, even for people who grew up here); we both got sick a few times with cold-like symptoms that hung on far too long; and we endured the usual array of strikes, breakdowns in our building (elevators, water, heat), and administrative challenges with various French bureaucracies. As a result, a lot of things got put on the proverbial back burner. For example, posts on all our blogs have been few and far between, and it’s been months since we’ve had any new articles on Interesting Thing of the Day. I’m still behind on several important projects for various publishers. And we’ve had precious little time for sightseeing or other leisure activities. I’m hoping that January will indeed be a fresh start, that I can stay (or get) on top of my various obligations, and that 2008 will be a year with fewer distractions and more fun. My goals for the year include not only writing the usual array of books and articles, but some entirely new and interesting projects, several trips, and a generally lower level of stress and higher levels of sanity and solvency. Tomorrow morning I’ll take the road test for my driver’s license, and if I pass, that’ll be one more big thing I can cross off my list. (If not, well, I get four more tries…) Then, as long as life isn’t too interesting, I’ll try to go back and fill in some of the many blanks on this blog about how we got where we are now and what lies ahead. Not technically France-related, but pertinent to the title of our blog, is the news that an enormous white truffle was dug up in Tuscany last week. Weighing more than three pounds (almost 1.5 kg), this pungent monster may break the Guinness World Record for largest truffle. In a classy move, the folks who found it are planning to auction it off on Saturday, with the proceeds going to charity.